Are you thinking about getting a new shower head? I was given the opportunity to try a really good one that I want to tell all of you about. The 3 inch Shower Head by xeiccob is not just your ordinary shower head. 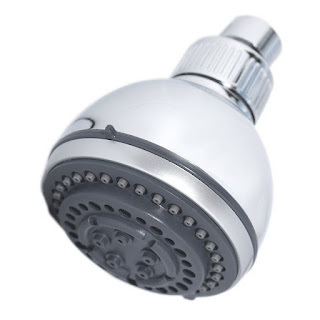 This is a filtering shower head. It reduces sulfur odor and reduces scale and chlorine. It leaves your skin and hair feeling softer and cleaner for up to 10,000 gallons of water. This wall mount shower head is easy to install and even comes with a roll of pipe thread tape. It has 5 adjustable settings to make your shower a pleasant experience. This sounds like a great shower head, I LOVE that it filters your water! :) Thanks for sharing! OMGosh, that's just what we need. Our shower head is just tiny and terrible! It appears sounds like an awesome shower head, I LOVE that it channels your water! :) Your said channels are so great in quality, I think. A debt of gratitude is in order for sharing!